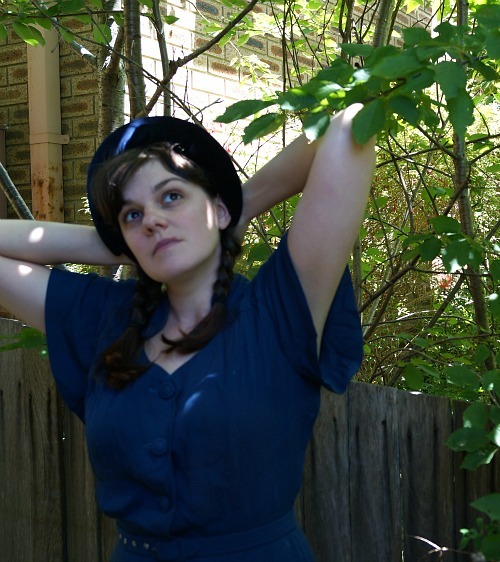 It's been a while since I've done a hat refashion, but with my stack of rescued op shop hats reaching to the ceiling and a desire for a boater hat to call my own, a hat makeover was calling me. I didn't take a before picture, but I'm sure you can imagine it. 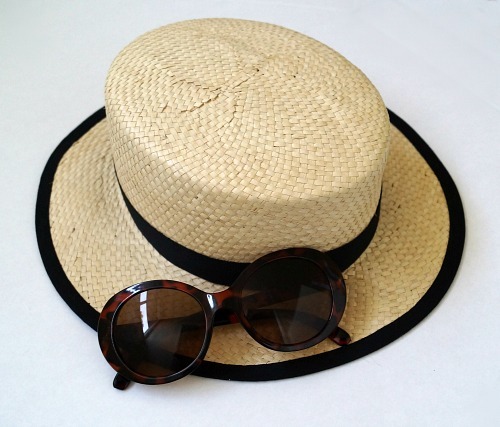 A plain, round crowned, broad brimmed straw sun hat, looking a little tired and dusty, blending in with all the other perfectly respectable but a dime-a-dozen straw hats. It is far from perfect, with some flaws in the straw and my quick curve cutting, but at an estimate materials cost of under $5, I'm a happy little hat wearer. If I don't look it, it's just a reflection of how I feel about taking photos of myself. Now to take some inspiration from these stylish boater-wearing ladies as I strut around in this during the last of the summer sun. 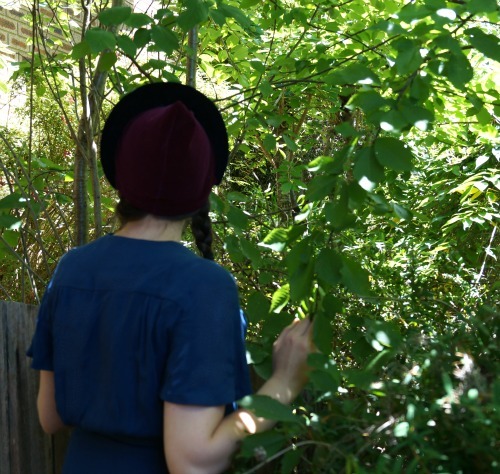 The Trove Pattern Project is back with another review, this time a free pattern from the Australian Women's Weekly from 1949. It's a pixie hat, "as worn by Princess Margaret", and you can find the pattern here. 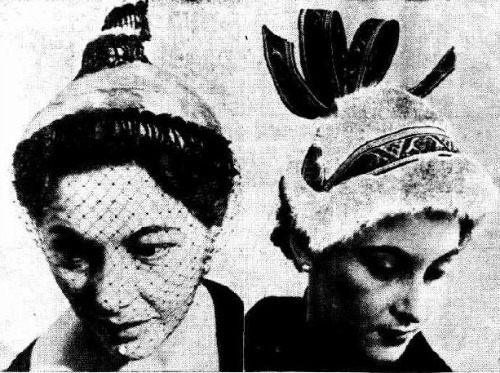 As you know, I developed an interest in Pixie hats last year, and my research back then turned up this pattern. I knew I wanted to make this one of the first patterns I tried out. My review today is pretty short because, compared to the 1954 scarf hat, it has very few issues. I've only made up a quick version, so you won't be seeing any close ups of my long hand stitching and lack of lining. The magazine version, and Princess Margaret's original inspiration, were both made of velvet, and I've done the same. One key step in the process is stretching your fabric on the fold of the brim piece around the wired buckram brim foundation. So you will need something with stretch, or with a reasonable amount of give and cut on the bias. This is actually the secret to how my version ended up being a colour block hat - the first pants I cut up fabric I tried didn't have the required give. They do suggest felt is possible, but I think you would end up with too much thickness at the brim when it is folded, unless you used a very thin felt. The size worked for me as it was - my head size is 22.5 inches. It isn't even tight! The pattern is hand drawn, and not close to symmetrical, even though the hat looks like it should be even. I don't know why this bugs me so much, but this is so often the case with these patterns and I don't know whether it is on purpose or not. I think in fact that is exactly why it bugs me. Anyway after drawing my own I folded it in half and evened it up. The hat sewed up easily and the instructions covered the steps pretty well. You have to stretch the brim over its foundation, as I mentioned before, so the more stretch your fabric has, the less bunching you have at the join of crown and brim. I did struggle with the joining the brim and crown and it didn't look like it would sit up properly, but once I put it on there was no problem. I didn't bother with lining or the headsize ribbon, but the instructions for these seem ok. 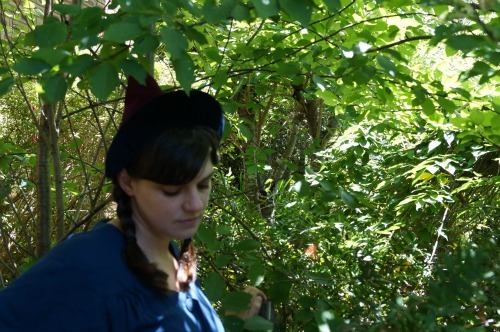 The hat is designed to sit towards the back of the head, with the brim across the top. In windy situations I'd recommend a hat pin or some other attachment, but for the purposes of wandering around and taking photos I found it stayed on fine with nothing. Sorry about the blurry photos by the way. I failed at selfies again! 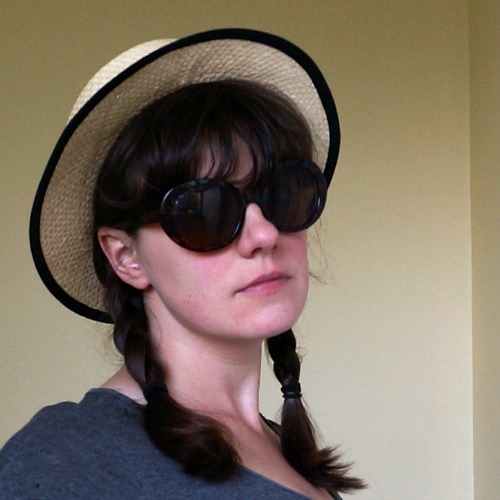 This hat falls into the category of "looks cute, but I wouldn't wear it." 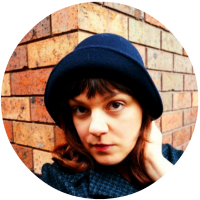 As I mentioned on instagram, I felt like a 1940s witch as soon as I put it on, and I can't really get past that. 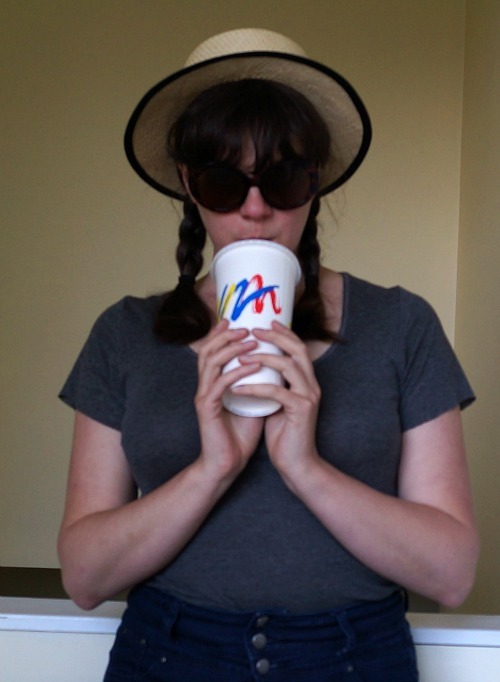 I love the shape of the brim framing my face, but the pointed crown is just a bit too much for me. 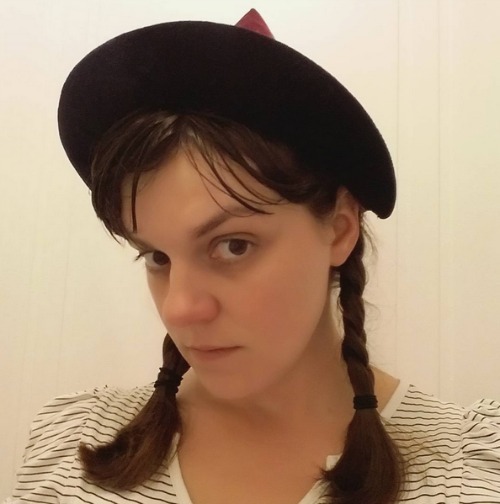 You could round off the crown, but then it wouldn't be a pixie hat, so why bother? I'd love to find a way to make it wearable, but I just don't know how to do it. Perhaps trims would help. I feel that a pixie style without the halo brim might actually work better for me. Short of any inspiration in that direction, I'll be keeping this pattern for vintage Halloween looks or maybe a cute Christmas elf. Or scaled down for an adorable little girl's hat! What do you think? Too witchy or just the right amount of pixie charm? I've already started on the next pattern, and I have hopes for its wearability...if I can just work out the instructions. 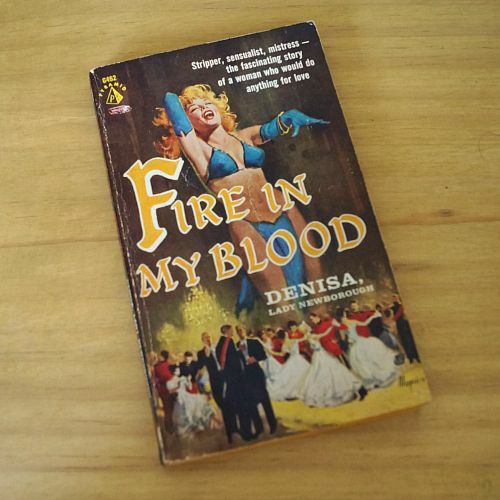 "I just love myself in black velvet and mink, and I know diamonds suit me..."
These are Denisa, Lady Newborough's first words about herself, in her memoir "Fire in my Blood". My first introduction to her, however, was through the stories of my husband's grandmother, Judy. Judy was living in London in the 1950s, after leaving Hungary and before moving with her husband and young family to Australia. They lived in a boarding house with a number of other Hungarian expats, including a young woman who was a milliner. This young woman got a job working for the milliner Lady Newborough, who was known for having been a nightclub dancer in Europe before somehow marrying Lord Tommy Newborough. She had long red nails and smoked her cigarettes in a long cigarette holder. Apparently this young milliner took offence to being hovered over by Lady Newborough while she worked, and suggested that perhaps her employer would make more money out on the street corner. Not surprisingly, she was fired. Not only that, but apparently she found herself unable to obtain employment in any other millinery houses in London. Left: The Newcastle Sun 7 Oct 1954. Right: Brisbane Telegraph 28 Jun 1949. I suppose it was before this incident, while the young woman was still employed, that Lady Newborough needed some renovations done and ended up hiring some more of the boarding house tenants, including one who was a plumber, and some others less qualified, including Judy's husband, to paint. Apparently she was very good to them, and got them whatever food they wanted for lunch. She also had a draw full of boxes of chocolates, which were gifts from her admirers. But since she wanted to keep her figure, she never ate them, and was happy for the men to take any they wanted. I enjoyed this story, but not having heard of Lady Newborough, I didn't think too much more of it. That was until I was re-watching some British Pathe videos from the 1950s, and realised I had heard of her! In fact, one of my favourite videos, of hat fashions at the zoo in 1952, displays her hats. She even appears in one or two! Here are the British Pathe videos of her work. Left: Examiner (Launceston) 7 Nov 1953. Right: The Mail (Adelaide) 23 Apr 1949. The book is entertaining and written with a funny, descriptive style, without any unnecessary filler. It's a bit like reading a rambling but fascinating series of anecdotes from your grandmother - if your grandmother led an extremely colourful life. Denisa was unquestionably a firecracker, and lived a life full of adventure, and empty of shame. She had her boundaries, and never crossed them, but danced wildly right up to them without regret. This quote goes a way to explain Denisa's ruthlessness in reaction to her employee's insinuation. (Although she was arrested in the 1960s for allowing her Mayfair premises to be used for prostitution. It didn't stick, so who knows.) In general, I feel that the qualities she claims in her own writing are also present in Judy's stories: friendliness, openness and material generosity, many admirers, and a fiery temper when crossed. Left: The Age (Melbourne) 14 Jan 1950. Top Right: Townsville Daily Bulletin 20 Mar 1948. 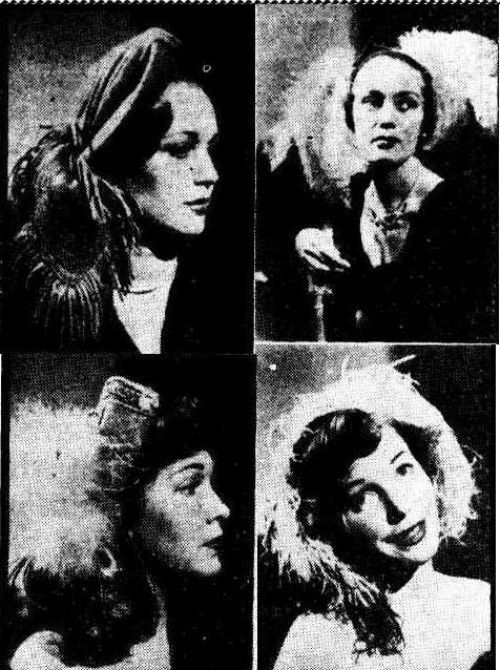 Bottom Right: Brisbane Telegraph 18 May 1949. She only refers to her later occupation a couple of times in the book, and only when it relates to her current anecdote. "One of the accomplishments they taught us little Continentals was the "art of chic", which means needlework plus a little something else. I was glad of it years later when I opened my hat shop in Mayfair, and I was glad of it then, for I worked some wonderful transformations on that one cut-down evening gown of my mother's." I had to look up the names she drops in this one, but evidently she enjoyed custom from many actresses. 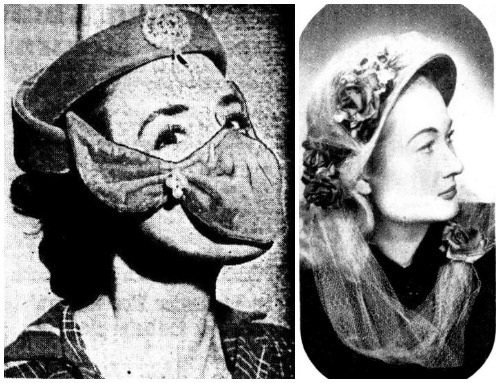 "When I started in business he sent me customers like Eileen Herlie, Judy Campbell, Edana Romney and Glynis Johns; he commissioned hats that were worn in films and publicized in the press and paid handsomely...and nearly ruined my business because people began to think the only hats I could make were crazy picture-in-the-paper ones." In fact, that's Eileen Herlie in the striped hat, scarf and umbrella combo earlier. Thanks to the wonders of the internet, I can piece together various bits and pieces, although like her own book, I don't know what to believe. Jewels don't lie, I suppose, so the pieces from her personal collection that were auctioned last year, are something we can take at face value. This is my favourite, and really I'm glad I didn't know this auction existed! Not that I could have afforded the £13,000 aquamarine necklace. 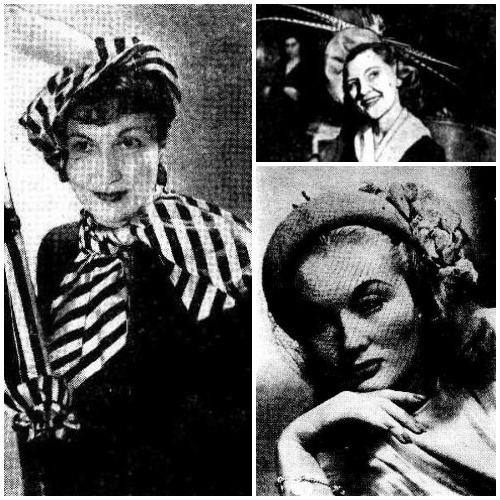 The newspapers reported on her divorce case from Tommy Newborough, and also on her beginnings in the millinery business, as required to pay her bridge debts, and is described as "one of the most beautiful of the pre-war socialites" in another article about her turning a hat-making hobby into a business. 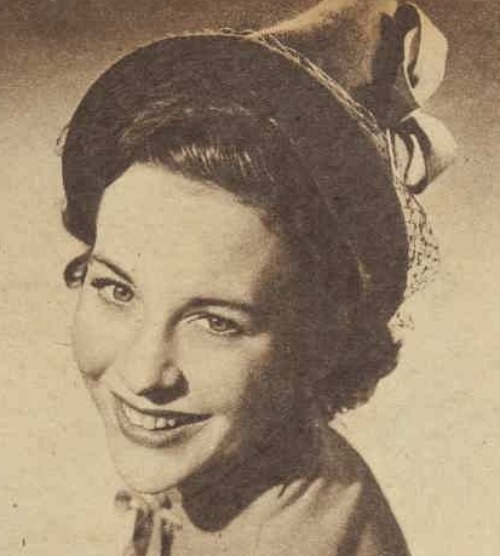 Thanks to Trove I've been able to find the images of her hats that appear in this post - some outlandish, many more understated and elegant. What I haven't managed to find are any of her surviving hats anywhere, but perhaps one day.